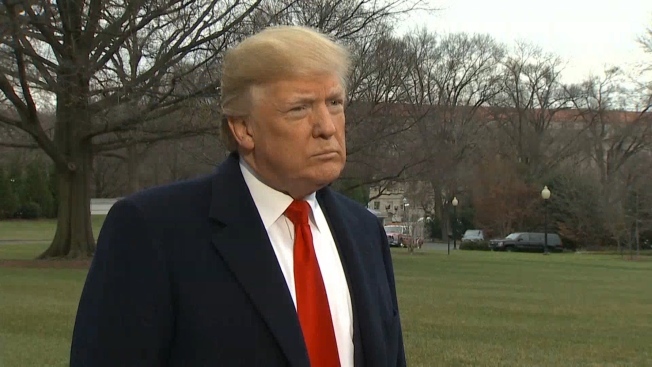 President Donald Trump incorrectly claimed in a television interview that two people were shot and killed in Chicago during then-President Barack Obama's farewell speech. Trump referenced Obama's speech in an interview Wednesday with ABC News and said, "Two people were shot and killed during his speech." "They weren't shot at the speech. But they were shot in the city of Chicago during his speech," he added. The portion of the interview in which Trump made the remarks was not televised, but was included in a transcript that ABC posted online. Chicago police records show no one was fatally shot in the city on Jan. 10, the day of Obama's speech. There were five shootings, but none occurred while Obama was speaking. Trump has criticized Chicago for its soaring violence, saying on Twitter this week that he would "send in the feds" if the city can't "fix the horrible 'carnage.'" During Wednesday's interview, he said the nation's third-largest city is "like a war zone." Chicago ended 2016 with 762 homicides — or an average of two people killed per day, a rate that was widely reported at year's end. It was the highest number of homicides in the city in two decades and more than Los Angeles and New York combined. There were 3,550 shootings, a nearly 50 percent increase over 2015. The majority of the shootings occurred in only five of the city's 22 police districts. Those five districts, located on Chicago's South and West sides, are poor and predominantly black areas where gangs are most active.